The reason of popularity of these money transfer services is obvious. They can be used by anyone and anywhere. There are very few countries where Western Union and MoneyGram do not operate – DPRK and Iran. So, if you want to send money, you just need to go to the nearest office of one of these services and follow the instructions of an employee. You fill in a form and hand cash to the cashier. When everything is done, you receive a special unique transfer number which you need to proceed to the receiver. In Western Union there are 10 numbers, MTCN (Money Transfer Control Number), and in MoneyGram – 8 digits of Reference Number. Some countries have limits of sums that can be transferred and also in some cases you need to answer Test Question. Its Answer should also be given to the receiver of money. 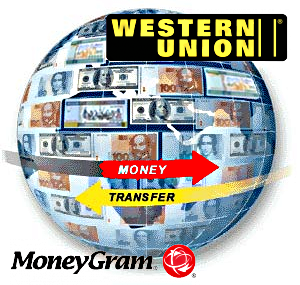 A person who is intended to receive money transfer must get to any office of Western Union and MoneyGram. There the Receiver provides personal information and the transfer money (and, if needed, Answer to the Test Question). Finally, the Receiver gets money and leaves office. These money transfer services are known for quite big commissions and they are more noticeable for sending small sums. What makes Western Union and MoneyGram the most desirable systems for scammers? The answer is simple. These money transfer services are not too secure. For example, bank transfer of PayPal leave trails and can be tracked later or even returned. In Western Union and MoneyGram this is impossible, as everything is done through pure cash. Of course, you need to identify yourself to send and receive money even in these services, but in many countries this is not very strict procedure, and there are even ways of avoiding it. As a result, a scammer may even collect money using someone else’s name or ID and still have what he or she wanted, and you will not manage to track anything, because people don’t need any registered account to use these services. Western Union and MoneyGram warn their customers on possibility of scamming from International dating sites, and they are well aware about this situation. Unfortunately, everything they can actually do is to add some links on their sites leading to comprehensive information of scamming. There is no 100% secure way for them to protect you from frauds. You are the only one who can protect yourself from scamming through Western Union and MoneyGram. DON’T SEND YOUR MONEY TO UNKNOWN PERSON THROUGH USING THESE SERVICES. On the other hand, Western Union and MoneyGram remain one of the most widespread and popular ways of transferring money around the whole globe. They shouldn’t be always associated with scamming, as these companies are not guilty in unfair people using them. There are many people who refer to their services for legal purposes, so it is only you who should learn how to define scammers and not to help them cheat on you. Previous Article← Travelling and Visa scenarios. thanks a lot for your interesting article.